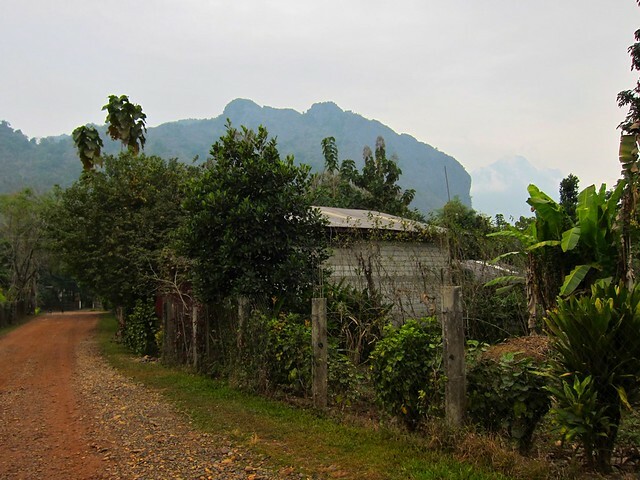 Christmas in Vang Vieng, Laos – snackettes. 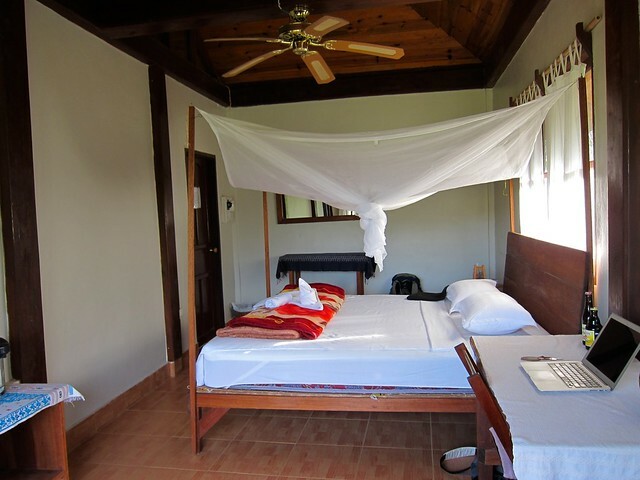 Vang Vieng: impossibly lush, gorgeous stretches of crisp, winding river; towering jungle-clad mountains that make one contemplate the meaning of life; some a**hole in neon swim trunks, sipping Lao Lao from a plastic bucket, urinating off a nearby dock. The problem with Vang Vieng (or the best part about it, depending on which side you’re on) is that this tiny, once-tranquil village has had the misfortune of being overrun by hoardes of drunk, half-naked college kids who descend on the banks of its river every day to party, go river tubing, and pass out in its gutters. In almost any other town in the world, this might be OK (well, everything except for the gutter part); in a conservative country like Laos, where women do not bare their shoulders or legs, and where married couples are not even supposed to touch in public, the mayhem that goes on in Vang Vieng is completely misplaced and utterly embarrassing for everyone observing (read: the locals), and everyone involved. This party scene doesn’t just happen quietly within the walls of bars and clubs – it now completely dominates Vang Vieng river life, where rickety bamboo bars line the river banks, offering “buckets” of Lao Lao (local whiskey) to river tubers and blast painfully loud music all day – all while Laos women bathe in full-length sarongs just on the other side. While some of the locals are becoming wealthy off of the tourism boom, the party scene that came with it has destroyed the once-quiet town and created an uncomfortable mix off hung-over tank-top-clad 20 year olds tramping over locals’ baskets of fish drying on the side of the road, with the village’s kids inquisitively watching the drunken craziness unfold. 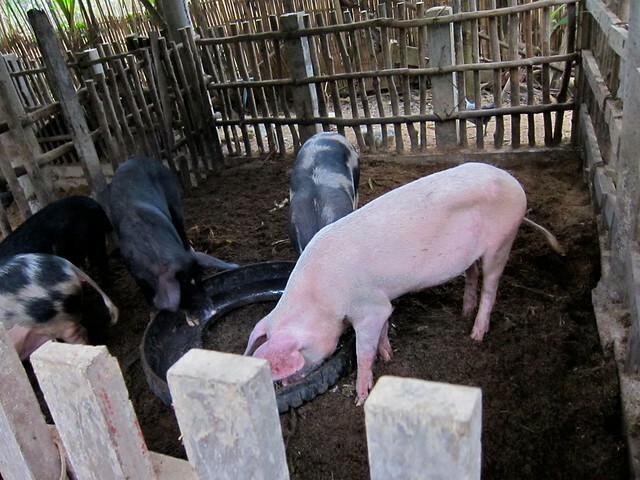 After a long, sweaty walk we made it to the place where we hoped we would be able to stay, the Vang Vieng Organic Farm. 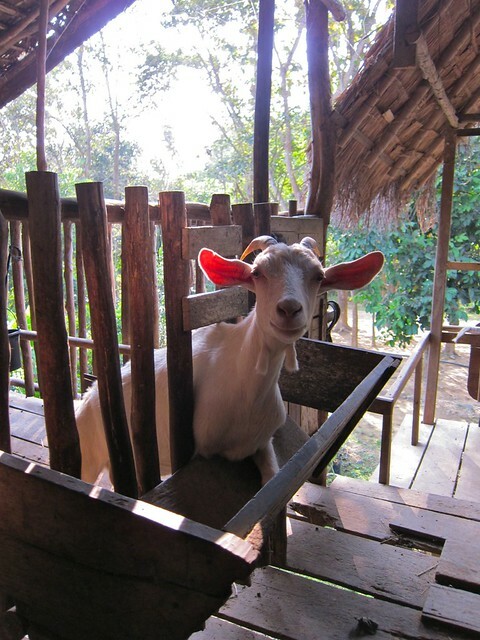 The farm is run by people of the Hmong tribe (one of the many traditional Lao ethnic groups) and is set on a rugged piece of land nestled in a lush valley beside the Nam Song river. Don’t think it looks that bad? 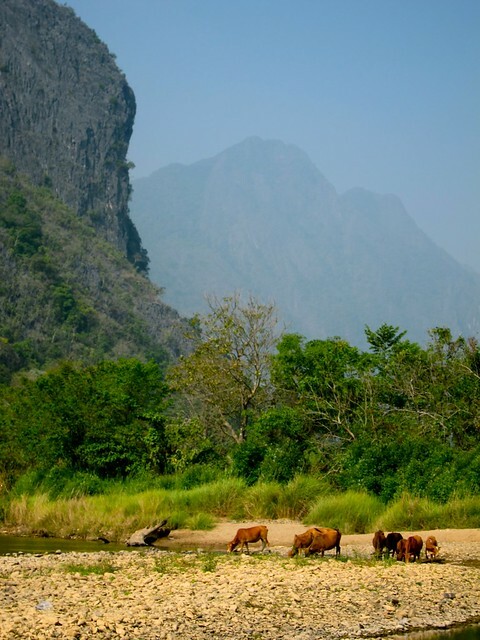 It’s hard to convey how LOUD it really is as it is amplified by the surrounding mountains, but also consider that the Vang Vieng tubing scene only started in 2009. Just imagine what the river will be like in 10 years. Sadly, the kind owner of the organic farm, “Mr. T”, blames himself for starting the whole Vang Vieng tubing craze. What was originally an activity that he set up for the volunteers who work on his farm to relax after a hard day of work has blossomed into the tourist attraction that it is today. On one occasion we were trying to enjoy a peaceful dinner at the farm, when a lost, drunk, and horribly smelly tuber in nothing but a neon bathing suit sat down at our table with us; having no inkling of where he was, we had to get up from our dinner and arrange a tuk tuk ride for him back into town (you see, many of the “tubers” never actually get into their tubes at all – they party at the first river bar all day and then have to get a taxi ride with their tube back into town). The next night, the same thing happened to us again! …except this time the kid was wearing a Santa hat and was a whole lot smellier. Embarrassingly, he tried to “fist bump” Mr. T on his way out the door. It didn’t go over well. The next morning, we awoke at 6:30 am to venture out in the freezing cold to scoop their poops, change their waters, and milk them to make goat cheese! 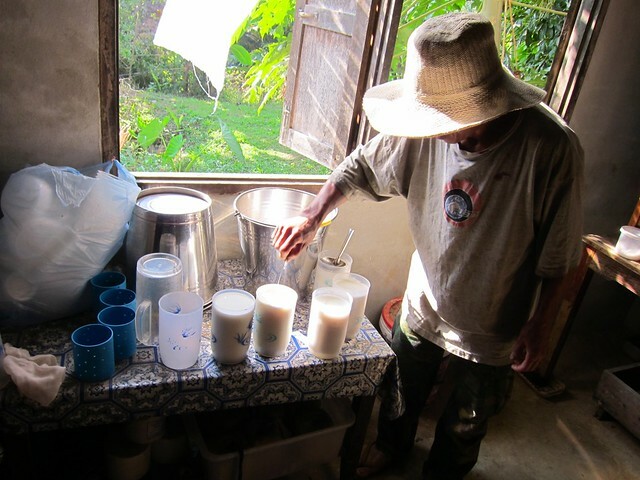 Afterwards, Pai showed us how to make goat cheese out of the milk, which involved stirring the whey from the previous day’s cheese into the fresh milk and then setting the mixture at room temperature in the goat barn for 24 hours. 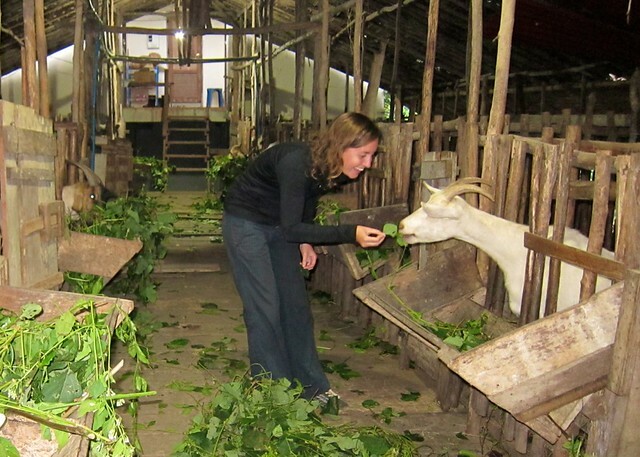 Essentially, the cheese that you eat at the farm is unpasteurized, untreated, and completely dependent on how safe the volunteer or farm staff were on the day they made the cheese. (God help anyone who ate the cheese that we made, as Scott accidently dipped a goat teat directly into the milk while he was milking his goat! Eek!) Luckily, everyday that we ate the cheese (which was definitely every single day – it was delicious), the cheese was wonderful and we never felt sick. One particularly frigid morning, we bailed out of our volunteer duties to spend a warm day inside reading books, watching Christmas Vacation (downloaded on iTunes), and opening presents — Christmas morning!!! From Scott, I got a book called Blood River about a guy who traverses the Congo (very interesting so far), some aluminum bracelets made of melted down U.S. bombs from the Vietnam War (the village that makes them collects the scrap metal and makes spoons and bracelets out of it for income – more on that later), some woven bamboo and paper bracelets, and a La Chouffe beer (it’s incredibly difficult to find really good beer here – we had carried these all the way from Vientiane)! Scott got some T-shirts, a Cambodian krama (traditional scarf), some carved spoons for cooking back home, and a painting on mulch paper. This was our first Christmas away from both of our families, and we both separately commented on how sad we were about not being with our families for Christmas. I think we both thought that Christmas day would come and go like any other day, but there was a definite sadness to Skyping home, seeing everyone together, and not being there for it. In the end, we were glad we felt that way, as it was a nice reminder of how lucky we were to have amazing families back home to miss in the first place. Once we had finished opening presents, we decided to do Christmas day right and go river tubing. We did not contribute to the above-mentioned drunken tubing mayhem (although we did sneak in a Beer Lao on the way down the river…). We could see why the tubing had become so popular in the first place – the scenery was stunning, and it was a great way to pass the day. On our last day in Vang Vieng, went on a kayaking and caving excursion. We were driven 20 miles north of town, where we were given a kayak and led down a beautiful river by our guide, Chon. Seeing the water cave involved sitting on an inner tube in FREEZING water and pulling ourselves along a rope through an underground tunnel over ½ mile long. Of course, it was pitch black inside, and all we had were tiny headlamps to light the way (mostly to illuminate the creepy bats that flew around above us!). At one point when we were really deep inside the cave, we could see water rushing into the cave through a small side tunnel; although I’m sure this water rushes into the cave all day, I got overcome with some severe claustrophobia-induced anxiety and wondered why we had not asked about the possibility of flash flooding…. When we got near the innermost point of the cave, our group of five were all freezing and our hands were chewed up from pulling on the wet ropes for 30 minutes, when our young guide pointed to an opening that we would have to swim under to go all the way into the main cave “room”. He said that we could either swim into the main cave (“although it might be completely flooded once we get there”) or we could turn around and go back. When I couldn’t hear everything that the guide was saying because I was last in line on the rope, I asked the nice Aussie guy a few people ahead of me to translate for me so that we could make a collective decision on what to do. He smiled, and in a hilarious moment that no one in our cold, miserable group will ever forget, said, “Just go back”. 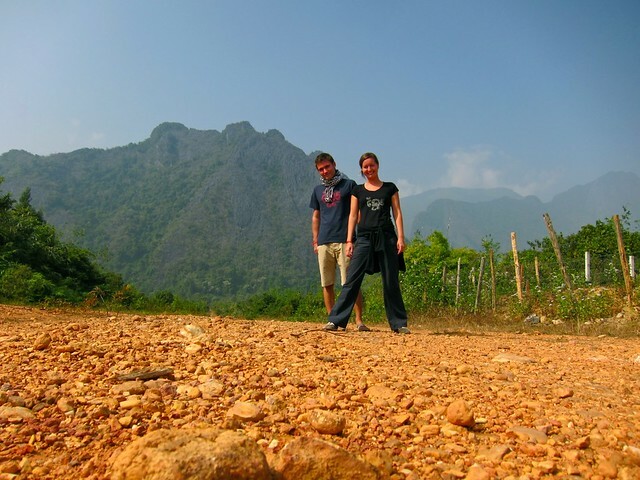 Despite being over-run by the very worst kind of tourism, Vang Vieng (or the outskirts, rather) was a beautiful and charming place that we would recommend to any other traveler. 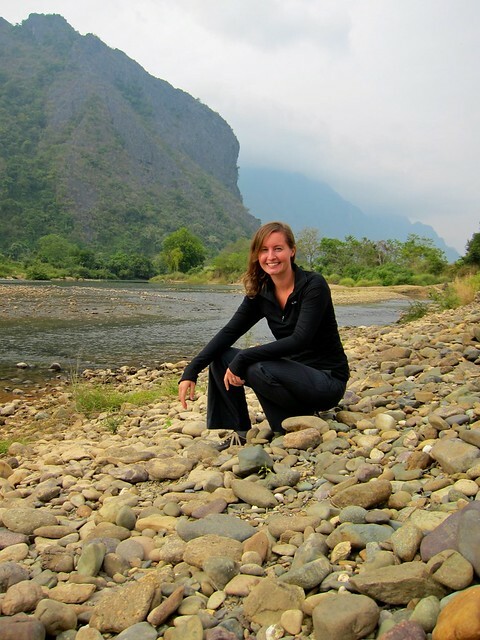 Maybe by promoting responsible tourism and requesting that the Laos government cracks down on the current Vang Vieng tourism-disaster-fiasco, this beautiful town will once again regain its natural shine – a shine preferably no longer due to the mid-afternoon sun hitting beer-laden urine arching its way off a rooftop bar and into the Nam Song River.